Robbie Hume has rejoined the Waterside men but isn't available for a few weeks. 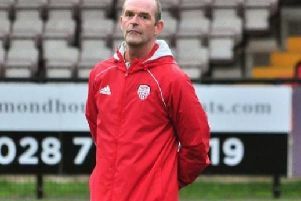 Institute boss Kevin Deery has strengthened his squad with the return of striker Robbie Hume. After things didn’t work out at Ballinamallard United the striker has decided to re-join the Drumahoe men, but he isn’t available to play for 30 days. His arrival is a big plus for Deery who has been crying out for a bit of experience in the his side. “Robbie is signing again, but he can’t play for 30 days because of registration things, but he gives us another attacking option and I’m delighted,” said Deery. The Waterside men are in Craig Memorial Cup action this weekend when they take on Oxford United, at Templemore Sports Complex (KO 2pm). Although Hume won’t be available, Deery is expected to field a strong side as he looks to keep up their recent good form, as he wants to do well in the competition. “I will approaching the game against Oxford the way we have approached every league and be at ourselves,” he added. “While there league hasn’t started long and they have had a few changes in their ranks, so because of that I’ll be looking to take advantage of things like that. “I remember going to watch the final last year when Limavady United beat Ardstraw and I remember that there was a very good turnout on Boxing Day. “The Craig Memorial Cup is a traditionally cup competition and I’m looking to do well in it and the chance to win silverware is something which every player should want to do, as it breeds confidence. “Because of that I want to make sure that my players have the right attitude going into the Oxford game and make sure sometimes matches can be very start-stop at Templemore because of the surrounds the balls can be going everywhere and you could be waiting a while for them to come back, so we have to fully focused and create our own atmosphere and create our own edge about our game. As for new Oxford boss Emmett McLaughlin he’s looking forward to the tie and wants to see how his squad will cope against Stute. “It’s a game which will be a good marker to see where we our at,” McLaughlin said. “I have just came into a new squad only a few weeks ago and we have a panel of young players, so it’s a great opportunity for them to test themselves against a higher grade of player. “For me it will be a good test to see what we are all about, but everyone is looking forward to the game and as everyone knows the club is always looking for young players progressing and playing a good brand of football.